Warlock is a hybrid Marijuana strain that has immediately won the first prize at the 1997 High Times Marijuana Cup. It has a pleasant, refined and smooth taste and a psychoactive high. Warlock is a hybrid feminized indica dominant Marijuana strain that harbors the best features of the Indicas and sativas. 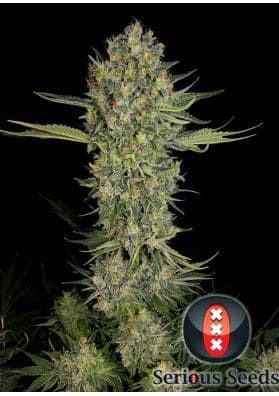 Created by a cross between Afghani and Skunk, Warlock stands out for its potency, its psychoactive effect and its relative ease of cultivation for the results it gives. In fact, this strain has immediately won the first prize at the 1997 High Times Marijuana Cup and has never left the market. It is a plant that forms a huge main central stem with only few medium-sized leaves surrounded by amazing resinous buds with a "popcorn" style releasing a pleasant but intense smell that can even bother in a growing room. After smoking it, Warlock will please you with a refined and smooth flavor and will offer you a psychoactive high, very sativa but with hints of Indicas that are corporal and long-lasting. In sum, this hybrid experience is rather memorable. Moreover, its buds-leaves ratio makes Warlock a suitable plant for pruning that will offer you yields of 400g to half kilo of powerful weed per square meter to be collected after 55-60 days in a growing room or in early November if you cultivate it in the garden.